Price action trading is especially useful for day traders. This is because in day trading, timing is crucial. By timing your entries with market tipping points, it is possible to profit from swift trades. 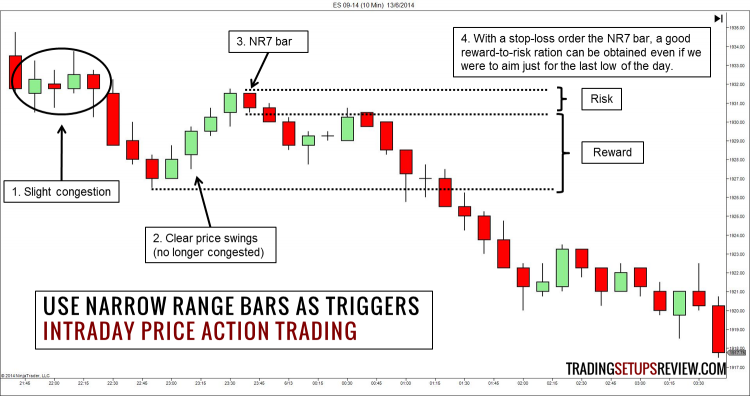 Price action offers the natural tool for timing market entries. Even when we are wrong, well-timed entries help to limit our losses. Thus, bar patterns and candlestick patterns are getting more popular among intraday traders. However, an astute price action trader’s ability extends far beyond price patterns. 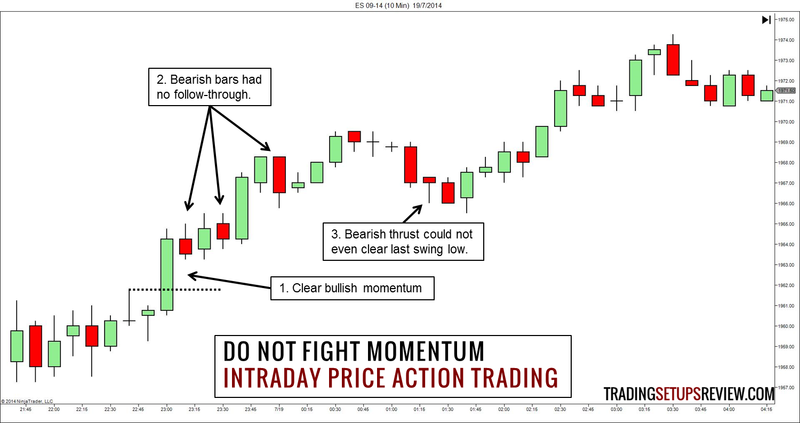 Here are three price action trading tips for intraday traders. Avoid trading when the market is showing a tight congestion. A tight congestion area hardly offers any high probability trades with solid reward-to-risk ratio. Some day traders are anxious to make money. Hence, they often aim for unrealistic profits. This behaviour is exceptionally damaging when the market is congesting. If you try to squeeze a 10-tick profit from a 5-tick trading range, you are wasting your time on the impossible. You end up clocking up more losses. Scalping for a couple of points might make sense but is a tedious trading strategy. Moreover, scalping is definitely not for beginners. Hence, do yourself a favour and take a break when the market is in a tight congestion. How do we know when a market is in a tight congestion? Each trading session has a volatility pattern. The market tends to show wilder movements at certain times of the day and tends to move in a subdued manner at other times. This volatility pattern provides a guide to the low volatility hours when congestions are more likely to occur. Usually, a trading session starts and ends with high volatility. Towards the middle of each session, the market might enter into a congestion phase. The chart shows 10-minute bars in the ES futures market. The trading session started with nice long swings. Towards midday, the market started to congest with small candle bodies. It was unwise to look for trading setups here. After a clear break-out like this bullish thrust, we could look to buy again. The market continued to drift upwards without further congestion. The example above shows a typical intraday volatility pattern. The volatility pattern might differ among markets. The best way to grasp the volatility pattern is to measure the average range of an hourly (or half-hourly) price bar. For forex traders, there are several free tools online that calculates the hourly range of different currency pairs. 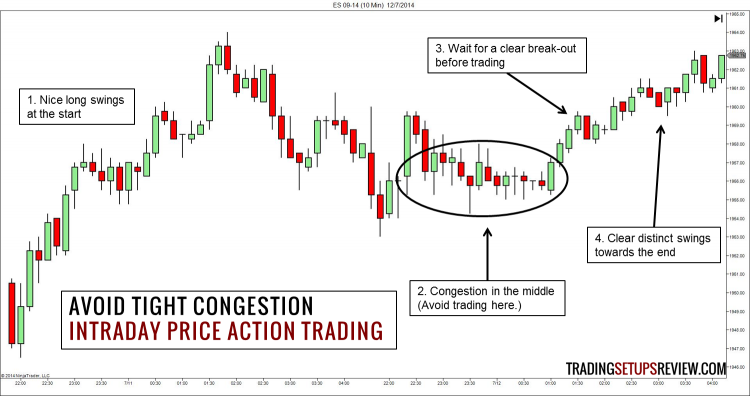 The clear-headed price action trader can also recognise congestion price patterns as they form. Congestion patterns occur when the market fails to close higher (lower) for at least three consecutive price bars. Once you find that the market is in a congestion phase, stop trading. Narrow range bars are windows of opportunities. They offer efficient trades that risk little and are likely to produce quick profits. There is an important exception to this price action tip. Do not trade narrow range bars within a tight congestion. Narrow range bars are characteristic of tight trading ranges which are not conducive for trading. Hence, do not trade narrow range bars indiscriminately. This example shows a NR7 trading setup. The trading session started with a minor congestion. Narrow range bars here were not ideal signal bars. However, the market quickly emerged out of the congestion. A bullish pullback ended with a NR7 bar. Even with a conservative target placed at the last extreme low, this NR7 trading setup offered a healthy reward-to-risk ratio. One of the worst behavior of a day trader is to trade against a trend day. A trend day is one that opens near one extreme of the trading session and ends near the other extreme. A bullish trend day opens near its low and closes near its high. A bearish one opens near its high and closes near its low. In a trading session that does nothing but rises, shorting again and again is the worst trading strategy. Yet many intraday traders do just that. There are two reasons underlying such destructive behaviour. First, these traders refuse to accept the fact that they might be wrong. They think that the market must be going down. They cannot be wrong. So they short again and again. Second, they are tempted by the prospect of selling at the top of the trading session. For some reason, they want to be dramatic heroes and not rich winners. To avoid fighting such losing battles, look for price momentum. The definition of momentum is the rate of change of price when used in technical indicators. Here, I use “momentum” as a loose term for the strength of a market swing. To recognise price momentum, pay attention to how the market reacts as it hits the last swing high or swing low. This example shows a bull trend day. This bar cleared above the last swing high with strength. The potential for a trend day was apparent as these bearish bars generated little interest. The strongest bear thrust of the trading session could not even push past the last swing low. These are signs of bullish momentum. They are crystal clear to price action traders. It was not a day for short positions. Do not trade against price momentum. Two out of the three tips above are about staying out of trouble. Do not trade when the market is in a tight congestion. Do not trade against the market momentum. For intraday trading, it is often more important to minimise the number of bad trades than trying to catch the trade of your lifetime. Focus on trading only when the market conditions are ideal. Want an objective definition of market congestion? Want to learn more about trading with price momentum? 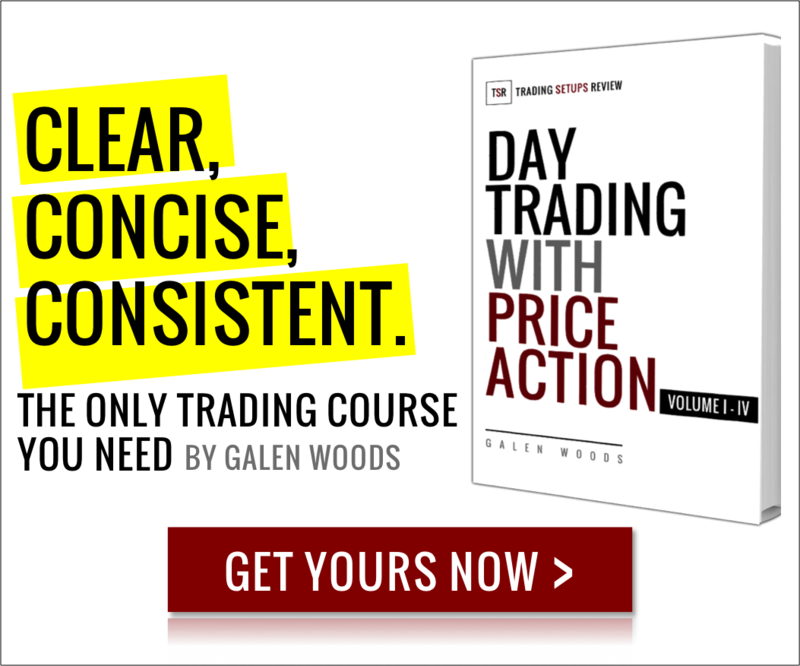 Check out my trading course – “Day Trading with Price Action”.